Based on the popular Chevy versions the new Ford small-block electric water pump features a durable 12-volt motor pumping up to 35+ gallons of water per minute. Each pump is made from durable but light-weight die-cast aluminum with epoxy powder coating for corrosion resistance. Comes with FREE billet aluminum backing plate, mating weather-tight connector and inlet fitting. Pump is 6in. high from mounting surface to top of motor. Draws 6 amps. 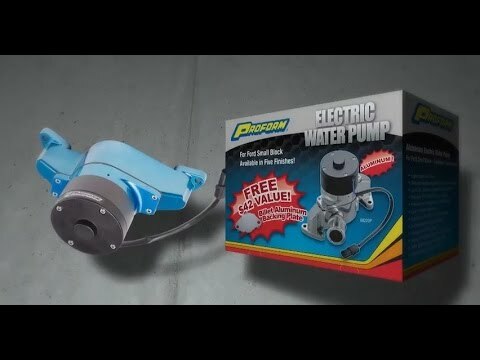 Based on the popular Chevy versions the new Ford small-block electric water pump features a durable 12-volt motor pumping up to 35+ gallons of water per minute.